Interbois is a specialist in engineered white pine wood. We strictly control every manufacturing stage. 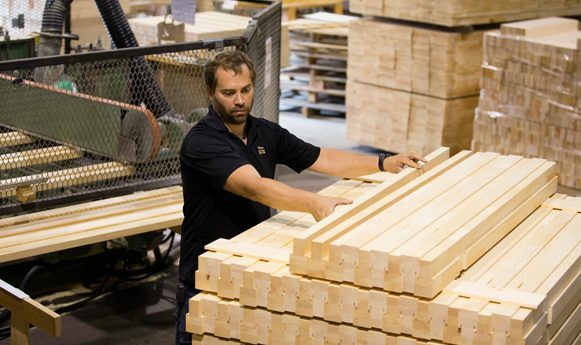 From the preparation of raw material, through finger jointing technology, to the finished product, Interbois checks every unit produce and we ensure that you receive a product that meets your expectations. We work with a number of different wood species: pine (jointed and solid), oak, maple – and wood fiber products (MDF). 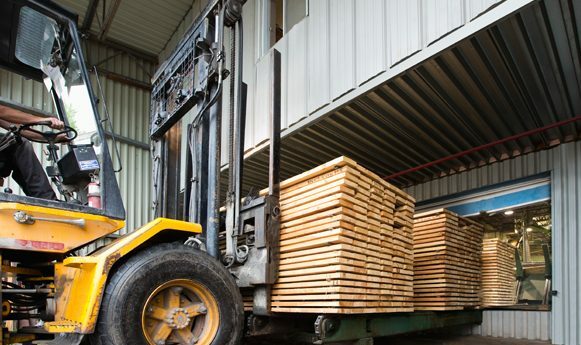 Interbois is a company with a vertical integration structure, meaning we control the supply chain from start to finish… from procuring green lumber to stocking finished products in our warehouses to delivering with our own trucks. At Interbois, quality assurance begins with the purchase of inputs. 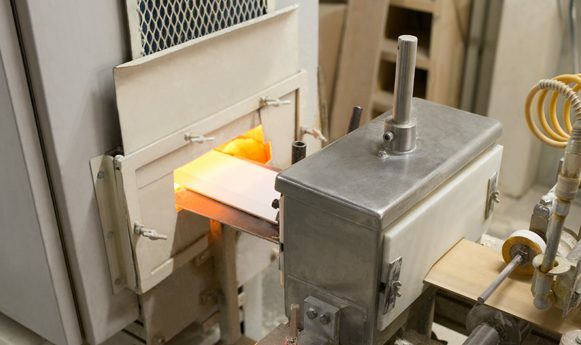 Because we work closely with raw wood suppliers, we are able to support an ever-increasing volume. All our suppliers are subject to quality control and must comply with our requirements. 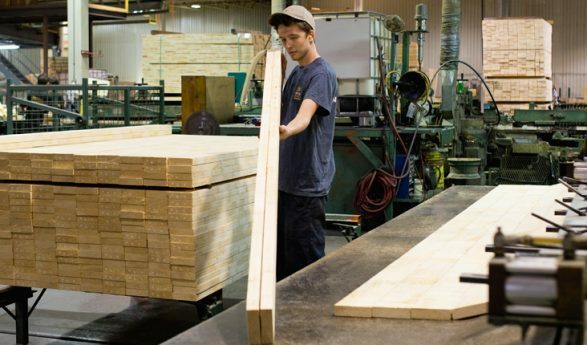 Our raw materials, mainly Eastern White Pine and particle board, are sourced locally and from Eastern North America. 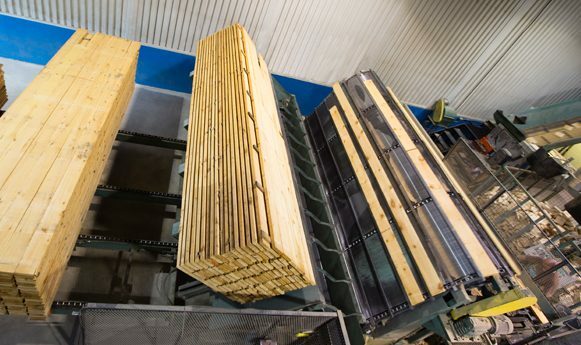 All timber used in manufacturing our components undergoes a controlled, automated drying process that gives the product a uniform, consistent moisture content. During that same process, by minimizing fiber stress, the resin it contains is crystallized using very precise methods developed and tested over the years by experienced staff that keeps an eye out for innovations and technological advances in drying techniques. Wood is first planed and canted to obtain a smooth rectangular surface. Then, the moisture content is measured on each board with a hygrometer. 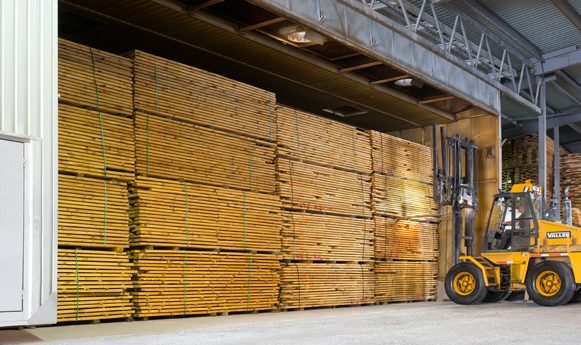 We discard any piece of wood whose moisture content exceeds our allowable threshold. 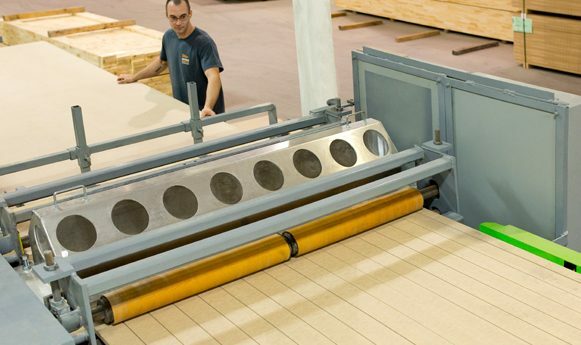 Following precise guidelines, an artificial viewing system equipped with laser cameras, X-rays and moisture detectors trims each wood plank, removing all unwanted defects to maximize fiber recovery. It is also equipped with a continuous humidity sensor. 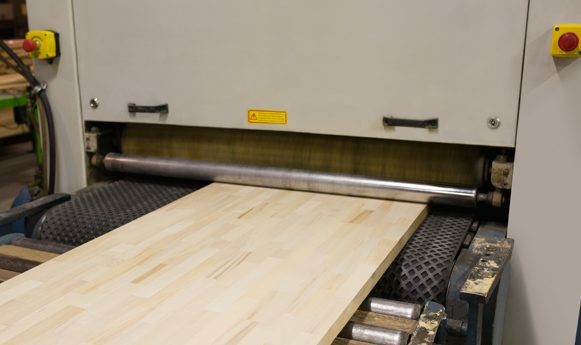 Finger jointing technology helps to produce higher quality engineered wood. Joints also provide greater stability and greatly reduce warping and torsion problems often found in solid wood. We use PVAC glue for its exceptional resistance to water, static and heat. This ensures joint stability even in humid or sunny environments, providing a product that is of much better quality than solid wood products. 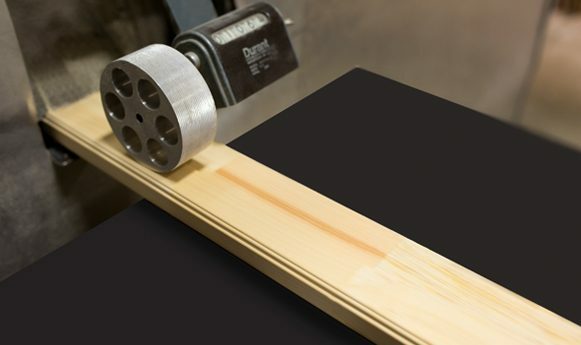 A bandsaw is used to go over jointed wood lengths or MDF boards and resaws them according to width thickness and specifications to optimize the finished product’s characteristics and minimize waste material. 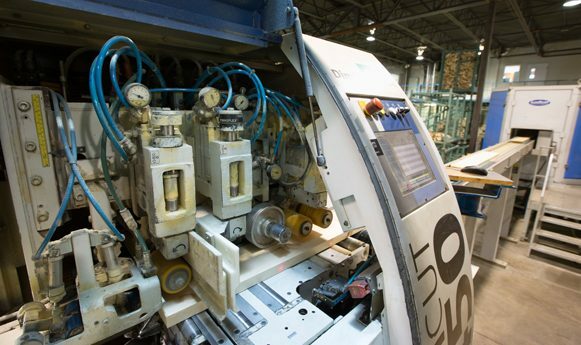 Our lamination bonding operations are performed using powerful high-frequency glue bonding equipment. 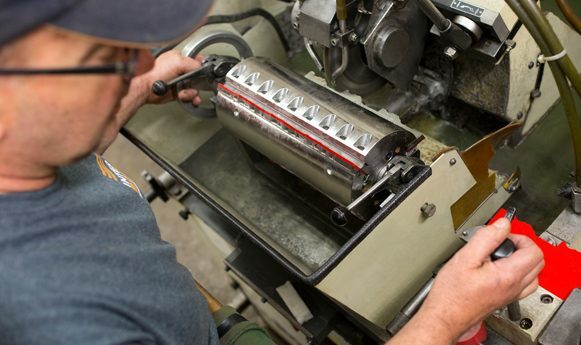 The quality and cleanliness of our cutting tools is essential for the production of quality mouldings. 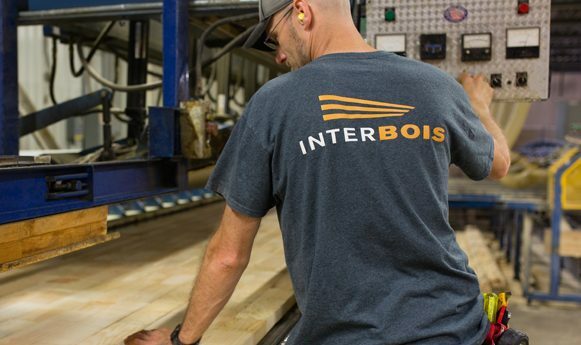 Interbois has acquired reliable, high-performance equipment for this purpose so our operations can be as fast and autonomous as possible. 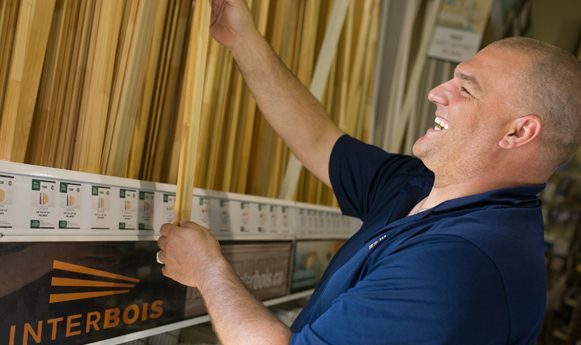 At Interbois, rigor and performance go hand in hand. 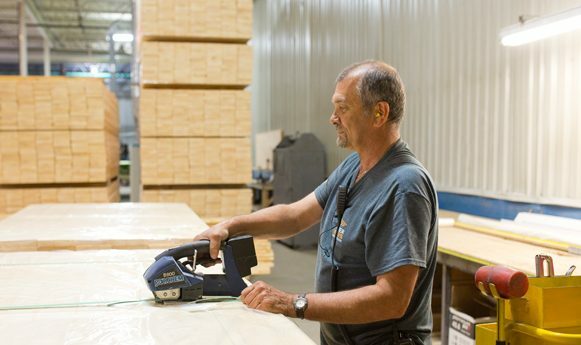 Sawed wood pieces are shaped and visually inspected individually during production to ensure that the product dimensions meet specifications. The customer will then obtain identical components no matter from which batch they originate. Tenons, dados and precision cuts. Component ends can be transformed for assemblage when needed. To ensure smooth, uniform esthetic results, pieces are sanded before the application of any finish; this helps soften the surface of bare wood and opens the pores. Interbois uses leading-edge technology to accurately primer paint every part coats on each of the product’s required by his customer. We believe added-value is created not only by the contents, but also by the container. At Interbois, we don’t skimp on packaging because we want our finished products to arrive safely, unbent and with the proper moisture content. We can customize size packaging to meet specific client needs. Also, we use recycled and recyclable materials whenever possible because we care about our planet. Our company has built up a wide distribution network to meet our customers’ needs. To ensure speedy delivery, we have high production capacity and inventory volume – and a fleet of trucks to meet all our needs. You can count on Interbois for efficiency, quality and speed. We are happy to give our retail partners a hand at their own sites. Our tech support team is made up of qualified representatives to properly inform your personnel, so they can then properly advise consumers. 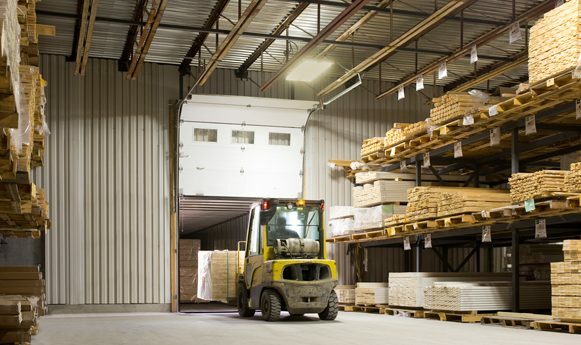 When visiting retailers, we do product quality assurance checks and ensure optimal warehouse storage. Our goal is to help improve your sales techniques, so you can sell more!